Today was a busy day for the little blue deck. Tomatoes (Black Cherry, Isis Candy, and Gold Nugget made the cut — alas, my Kellogg’s Breakfast and Dwarf Tims didn’t do so well as seedlings and were scrapped), beans, (more) lettuce, carrots, oregano, basil, and orange cosmos were all planted. Unfortunately, Philly’s expecting a week of rain and evening lows in the upper 40’s; so it’s not necessarily ideal, but the tomato seedlings were straining at the seams of their seeding container. And this gardener was sick of hardening. If you can wait until next weekend, by all means, do. Anyway, in preparation for the big day the seedlings were doused fairly generously with water so they’d come out of their containers fairly easily — which one hopes will help reduce transplanting trauma. The cucumber, pepper, and melon seedlings will join rejoin their friends in a week or two, after the evening lows have risen a tad. 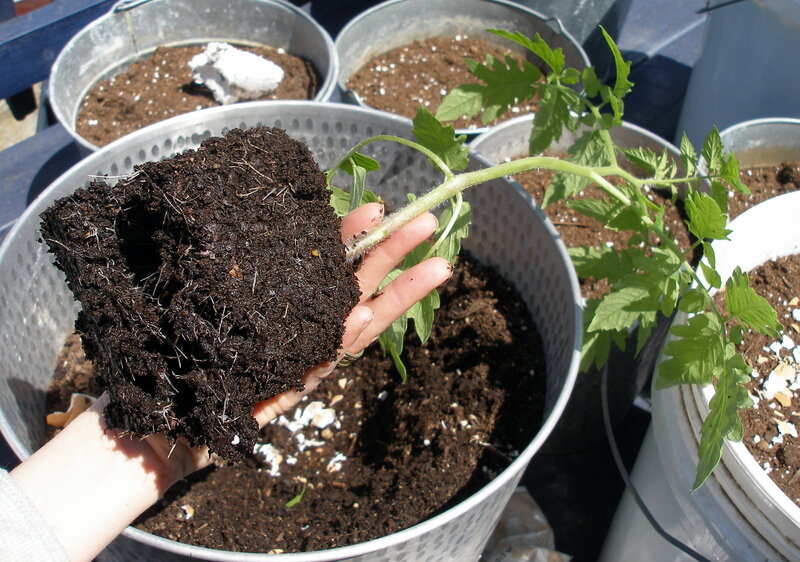 …Gently shake the seedling into your hand. 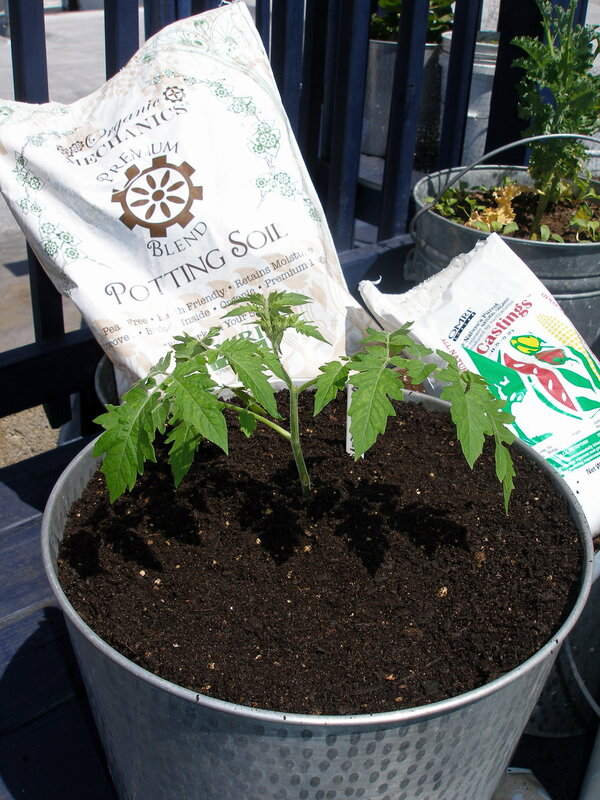 Tomatoes are one of the few fruits (or vegetables) that actually like to be planted below the soil line. That is, below the point where your seedling meets its original dirt. 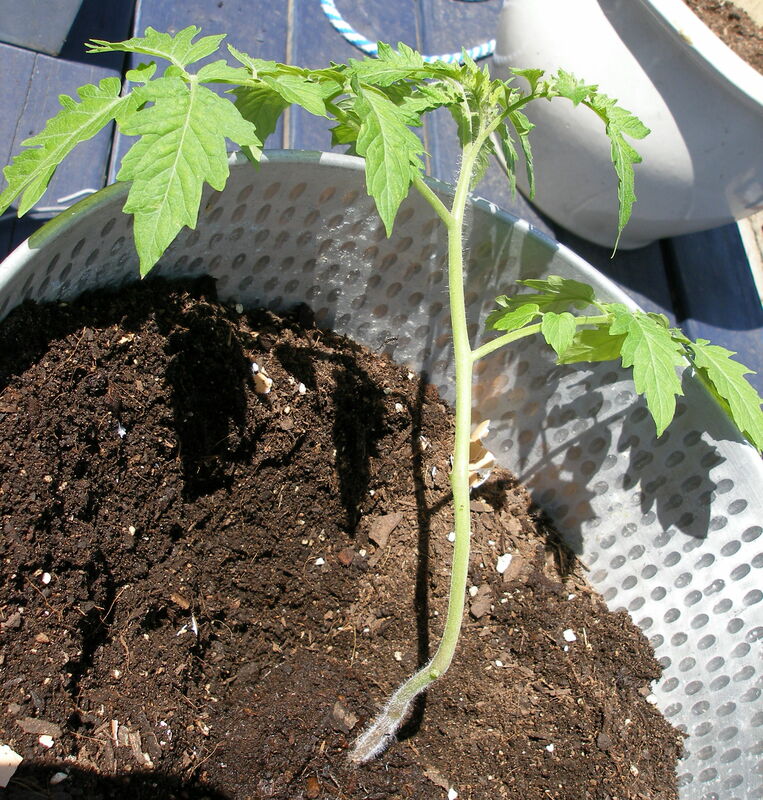 Strip the leaves that will be buried from the stem and set your seedling deep into its pot. This strengthens the primary stalks and roots will sprout from the submerged stem. Here, the black cherry has been surrounded with luscious seaweed-enriched mulch (to prevent splash back and, one hopes, diseases) and lettuce seeds have been planted around the perimeter of the container. 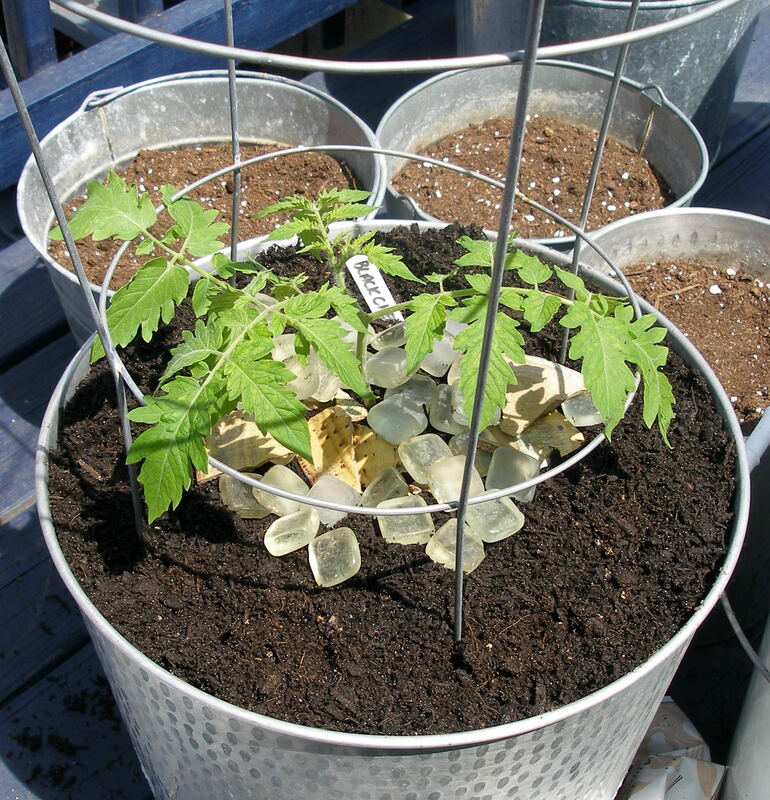 Lettuce in your tomato planters? You can do that? I linked to your site from some other site recently. I really like all the info you’ve got here. I’ve just started gardening for the first time ever and I’m growing everything in containers. I have a gold nugget, which I heard is good for containers, but what I’m really curious about is the Isis Candy. I’m growing mine in a 5 gallon bucket and I was wondering how you’re growing yours? I heard they get really big . . . but I couldn’t resist because they’re supposed to be so tasty! Thanks for the kind words! Isis Candy is an indeterminate and it grew pretty huge. One of my few 6+ gallon containers was reserved for the new kid on the block: the black cherry tomato (also an indeterminate, I believe). So Isis is hanging out in a 5-gallon bucket again. Unfortunately, last year it came down with early blight and didn’t produce as heavily as I would have liked. I’m trying it again, though — we’ll see. If it comes down with the plague, I’m yanking it out much earlier than I did last year, and planting something else in its place. 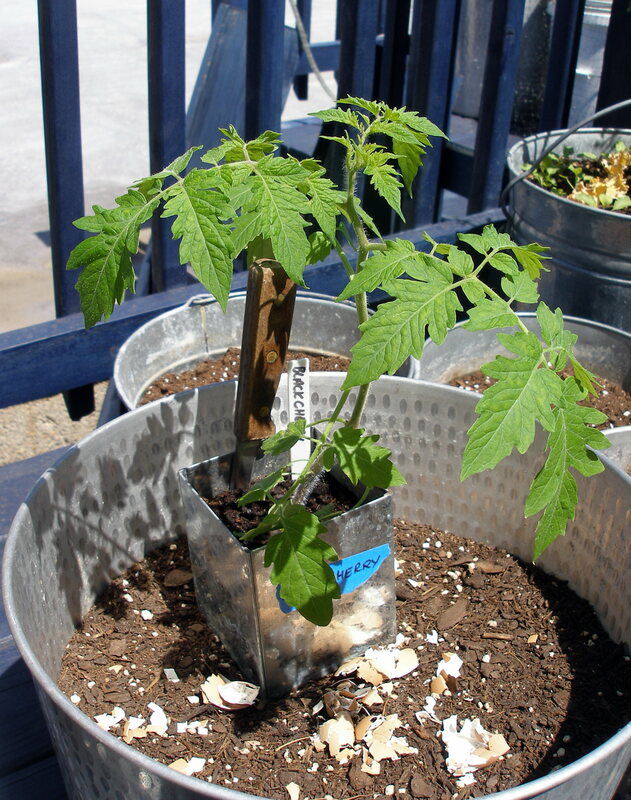 I’ll write more about this in a later post, but make sure you pinch the suckers off (the leaves that sprout from the joint of a main branch) — this will force the energy into producing tomatoes rather than greenery. So, that may not have been the most direct answer to your question. How about this: it’s certainly worth a shot. The tomatoes were very sweet and ripened at a different time than the gold nuggets. Good luck! What are those ice cube looking things? They’re tiles from our bathroom renovation job — I thought they made a pretty decorative top layer to the mulch. I’ll expand them to cover the whole surface once the lettuce pops.